Data-driven + lots of brand keywords? Start thinking like a marketeer... - We are CLICKTRUST. Client is ROI and Cost/sale sensitive (duh) and is currently facing very high cost per sale numbers on generic search terms in a market with CPC’s averaging 9 EUR . They desperately want to expand generic volume, and have gone through several agencies who each have failed to deliver this. The account contains both generic and branded keywords on both exact and broad match. The average time between first click and conversion is more than 3 days. Studying the path length reports in the search attribution tool showed us that generic queries almost always convert combined with branded queries. We can hence assume that the data driven algorithm that is looking at numbers would consider branded keywords pretty important. very strong decrease in sales from generic keywords and huge increase in cost per sale both in percentage and absolute numbers. massive increase in sales from branded keywords, and limited decrease in cost per sale in absolute numbers. When showing this to the client, they were schocked. Nobody cared about the cost/sale of the branded keywords decreasing from 4 eur to 2 eur. The cost per sale of generic keywords that increased from 100 eur to 300 eur in the data driven model was however enough to leave them gobsmacked. 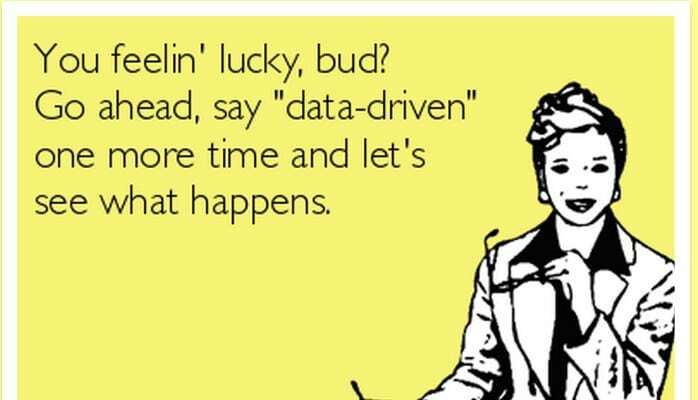 Statistically speaking, I’m sure the data driven model is correct. If it is providing weight to the number of times a specific query appears in the customer journey, than obviously branded queries will get a lot of weight. As data driven attribution will then decrease conversions on generic keywords, ROI sensitive clients will decrease bids. Branded queries will then become even more prominent, and the whole thing becomes a self-fulfilling prophecy. From an outcome-driven marketing & “lets grow revenue” point of view, this makes no sense. Cost per sale on branded search moved from cheap to too cheap to care, while generic cost per sale increased by 3 compared to a first click attribution model. Meanwhile, the site is ranking very well organically on all branded search queries and has limited competitors bidding on their brand. As a result, the actual value of generic queries is massively undervalued due to the presence of the branded queries in the account. Is is highly likely that the client would have gotten the sales that happened on the branded query through organic search anyway. So if datadriven is not taking the less important role of branded search queries into account on sites that are ok SEO wise, and uses frequency of search queries in the customer journey as a factor in the algorithm, we can expect ROI sensitive PPC managers to decrease overal media spend in the long run, as they decrease investment on generic terms. That can’t be the goal. I’ve seen this happen several times now on pure ecommerce players. They fail to scale the accounts, especially in smaller markets with products/services that have decision cycles beyond several days. Create a test to remove branded queries alltogether. Incremental impact on sales volume from branded paid search queries together with organic queries should of course be assessed. In both scenarios’s, by taking branded queries out of the account, conversion attribution will shift back to generic keywords and data driven will do its work on generic queries alone. Sales and media spend on generic search queries will go up while overall sales from organic and paid search combined should increase. If you’re interested by this post, this is the stuff the CLICKTRUST team thinks about daily while optimizing your accounts. We’d be happy to exchange ideas. © 2019 Clicktrust. All rights reserved.